Is STEPs+ Approach “Enough” for Children with Complex Developmental or Medical Challenges? “While I understand your concerns about progress with a medically complex child, we feel strongly that our approach can and does work for these children. Using the strategies at home while an experienced therapist guides you and your child in making specific skill gains is the best-case scenario. Putting food in front of a child on the tray doesn’t paint the whole picture. 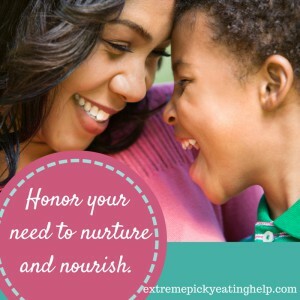 As the director of a feeding clinic, I have worked with hundreds of children who are NOT neurotypical, have multiple complex medical challenges, and who are severe enough in their feeding issues to require feeding tubes, using this approach. Most of my patients and my co-author’s clients have already had other therapies, from behavioral to SOS and sensory play therapies, and haven’t made progress. When the STEPS+ approach is applied, which can often take weeks or months for some families to get the hang of, with attention to gaining skills and addressing issues such as you describe your son having, these children make significant gains over time. Many have their feeding tubes removed. However, it doesn’t happen overnight, and it may not be what every parent feels is right for their child, and that’s okay. What is learned over a long period of time (months or years) cannot be undone and relearned in a few weeks or months. Patience is difficult for parents desperate for improvements, but patience is key. Children don’t seem to make progress for weeks or months, then suddenly they do! For a child with your son’s specific issues (sensory issues, airway issues, reflux, and an oral motor delay), it’s no wonder that he experiences anxiety about eating, as children who are uncomfortable while eating (for any reason) can fear doing it. Sensory issues affect motor responses, making food harder to manage and ultimately can cause scary episodes of poor control. Airway issues can impact the work of breathing, which is the primary concern of the body- to get enough oxygen. If there is any respiratory compromise, swallowing can get pushed to the side. You physiologically cannot breathe while swallowing, so it can feel alarming to swallow over a long period for a child experiencing this. Painful reflux (even if it is controlled now) in the past can set a child up for long-term aversions. The neural pathways laid down early in life can cause negative associations long after the reflux is controlled. Any oral motor delay causes problems. And yes, “making different foods available on his tray, day after day”, may not be enough. Much of what I do in therapy with my clients is manipulate the foods to match or slightly challenge the skill level of the child while adding sensory information in the way of taste, texture, or temperature. But children typically will not try a food until they are confident in their oral motor skills (and the sensory processing/proprioception that must go with them). There is nothing wrong with using a stepwise approach to food selection, and we discuss many other approaches in the book that help with this as well (Fraker’s Food Chaining, for one, Marsha Dunn-Klein’s Get Permission approach and “redefine try it” article). SOS is one tool in a therapist’s toolbox, and it sounds like you have been lucky enough to have a therapist who provides excellent therapy and is able to recognize anxiety and back off appropriately. However, we have heard from many families whose experience has not been this positive and their child has been coerced, some to the point of forcing a spoon into their mouth or “refeeding” food that has been expelled. For some children, any pressure to engage with food, kiss it or lick it, touch it is enough to increase anxiety and decrease appetite. These are the parents we see who have tried “SOS”, play or other therapies and feel like all the work has made the child’s eating worse. One problem we discuss in the book is the lack of consistent and thorough training for professionals providing feeding therapies. An ST or OT can go to one training or read one book and erroneously believe that they are now trained to do feeding therapy. In reality, a therapist needs to have the perspective of many seasoned therapists, go to many continuing education courses, and have enough experience to see the big picture- a positive feeding relationship is the ultimate goal. (See great articles by Suzanne Evans-Morris on New Visions website and Marsha Dunn-Klein on Mealtime Notions.). If anything that a therapist does causes more anxiety, gagging or vomiting, the approach needs to be examined. That is why we spent so much time helping parents find pressure and tune in to their child’s anxiety and resistance- and some children are exquisitely sensitive to even “mild” pressure. Trust is not easily gained, but is very easily lost, and it can happen if a therapist or parent feels pressure to “make progress” and pushes a child that isn’t ready. If anything that a therapist does causes more anxiety, gagging or vomiting, the approach needs to be examined.